The best part of saving on my shopping? The more I save, the more shopping I can do! However, finding the best prices and coupon deals can be daunting if you don't know where to look! 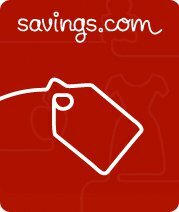 That's where Savings.com comes into play! With an easy to navigate site and great Savings savings from your favorite sites, like Macy's, Dell, Verizon, 1-800-Flowers and more, you'll find deals you'll love to stretch your holiday shopping budget as far as it needs to go! You'll want to check out their Deals of the Day section for the latest offerings to save you time and money. Make saving even easier by signing up for email updates from your favorite retailers, when new deals and discounts become available! Search for bargain by category, whether you are preparing to shop for something specific, or looking for inspiration for those hard to buy for people on your holiday list! With a site wide motto of "Friends Don't Let Friends Pay Retail", Savings.com is committed to bringing you the hottest offers from a vast selection of retailers. Following on Facebook and Twitter give you more ways to stay connected to savings when you need them. While you are planning your Black Friday retail attack, be certain to scour the savings, coupons and deals available at Savings.com to maximize your shopping power this holiday season! What's on your Must Have short list this holiday season? Tell me in a comment below - I'd love to know! Thank you to Savings.com and PayperPost.com for sponsoring this introduction. Images and information sourced from Savings.com. The opinions above are both honest and my own. Thanks for the follow on MamaLuvsBooks! I was already following you GFC! I will make sure I'm following you Twitter and FB too!! !